Something tells us that winter will be coming early this year! Don’t find yourself unprepared. It’s time to freshen up on your fall and winter driving skills. From black ice to slippery snow, driving in weather can be compromising. We’ve put together this list of helpful tips when it comes to safely driving in the coming months. Winter tires are commonly used in Central Oregon, and for good reason. Whether your tires are 6/32 inch deep thread or you purchase tires with studs, having appropriate tires for weather means more grip on the road. If it is possible to work from home, or to shorten your commute, do it if it is icy outside. It’s never worth battling black ice. Often times, morning commutes tend to be the most slippery. Look for opportunities to shift your schedule to commute after morning ice has melted. Give yourself plenty of time. Drive slower than the speed limit on the roads that haven’t been recently plowed. Be cautious of black ice and slippery bends. Allow plenty of space between you and the cars in front of you. Drive with your lights on. Regardless if it’s night or day, your lights not only help you see the road, but it allows others to see you. 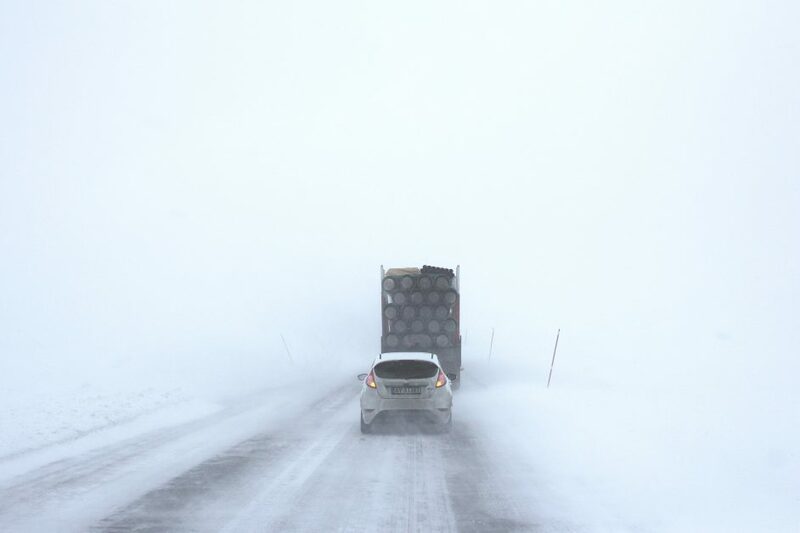 Foggy weather can occur during winter months, as well as hail or snowstorms. You should know to never turn your brights on in fog, but familiarize yourself with your lights to know which setting is good for what time. Accelerate slowly. This allows you time to feel your tires gripping on the road. When faced with ice, there is virtually no traction between the ground and your tires. By accelerating slowly, you are giving yourself more time to recover from a skid or sliding on ice. As always, take precaution while driving. Accidents are no joke. If you or a loved one have been in an accident, call Donahue Law Firm. Play Hard, Play Safe.